Dorothea Cheney is a contemporary realist painter currently living in Ketchum, Idaho. 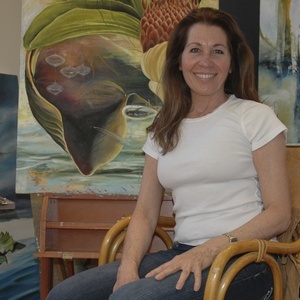 Her work is included in both private and corporate collections throughout the United States. Like a diary, my paintings are visual translations, re-creations of a moment of perception, an emotional encounter, a simple daily event that startled or awakened me into the "here and now". I am intrigued with the idea of the energy of emotions, both positive and negative and what that energy might look like. As I would write in a diary, the emotions that inspire me are my own and I thrive on the process of discovery and understanding of my reactions to them. For me, painting allows this discovery.